With each new year’s wave of films comes an array of new cinematic soundscapes, and this year has been phenomenal in that regard. Whether it marries perfectly with the visuals or can be cranked up on its own, a film’s score is integral to its atmosphere and overall aesthetic. At its very best, it enriches the film’s power by providing a layer of aural information that can inform the viewer on its characters and plot just as much as a the visuals. We saw a fantastic slew of soundtracks this year, and while many captured our ear and heart, only a handful are held dear. Here’s our picks for the best film scores of 2018. Justin Hurwitz has proved on many occasions that he has the chops to be a major player as a cinematic composer. His work on Damien Chazelle’s previous projects, Whiplash and La La Land, were both exceptional; however, Hurwitz scoring on Chazelle’s latest, First Man, is phenomenal in every respect. His compositions here are everything you’d expect from a major blockbuster; epic, sweeping, and triumphant, with melodies that enchant as much as they inspire and just enough spaced out thermion to give it that otherworldly quality. In Hearts Beat Loud, Keegan Dewitt lays down a tasty synthesizer bed for actress Kiersey Clemons to flex her impressive pipes over — and boy can she wail. He gives the compositions a steady pulsing beat and the right amount of sentimentality to pair with the “heart” in the film’s title. With some groovy and driving guitar and bass backing the layers or synth, Hearts Beat Loud is a quality soundtrack of tush-shaking pop with catchy lyrics. It’s more than just a film, it's something you want to put on your turntable. Nicholas Britell captured our attention with 2016’s Moonlight, but his work on Barry Jenkin’s If Beale Street Could Talk gave us chills. The emotionality coursing through his arrangements radiates off screen and into the viewers soul. His instrumentations marry Jenkin’s visuals perfectly and ooze with a romanticism that enrich the on-screen chemistry of the film’s leads. It’s pretty staggering just how whimsical and gorgeous Brittell’s musicality is, and his effort here is nothing short of extraordinary. Radiohead guitarist Jonny Greenwood has been blowing our minds with his film compositions since 2007’s There Will Be Blood, and unlike other composers, such as John Williams, who never seem to deviate from their tried and true formulas, Greenwood never ceases to amaze us with his bold experimentations. You Were Never Really Here finds him again morphing his sound. What he does here is craft lush instrumentations that provide a direct gateway in to the tortured mind of the film’s protagonist and his search for absolution, and he achieves this with masterful effect. 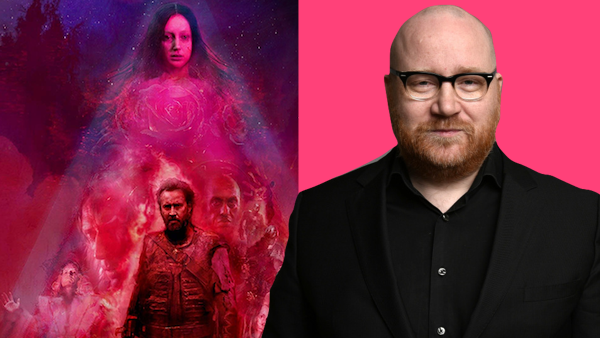 Jóhann Jóhannsson, who tragically passed away in February of this year of an overdose, was a powerhouse of cinematic compositions, and his score for Panos Cosmatos’ MANDY is a perfect example of his skills. His work on MANDY is easily amongst his best (or the best), and his arrangements here are ripe with emotion and lit with rage, full of brooding synth soundscapes, psychedelic experimentations, and a metal attitude. Simply put, the film would not be near as good without Jóhannsson’s backing tracks, which are just as piercing when accompanied with the film as they are on their own right. That's our list! Did we leave off your favorite score?! We want to know. Share your thoughts and feelings in the comments section below, and as always remember to viddy well!